A Phoenix police officer on vacation with his son in Hawaii, risked his own life and then some to rescue a young woman who was getting dragged out to sea by a powerful undertow. The Phoenix Police Department released this video. Phoenix Officer Guillermo Arrubla who also served with the NYPD, and his 19-year-old son were visiting Spitting Cave, a popular cliff diving location on the island of Oahu, on Saturday. Arrubla was enjoying watching others jump and had no plans on getting into the rough water himself until he spotted a 20-year-old woman in distress. Police released video taken by Arrubla’s son just before the officer climbed down the cliff and into the water. 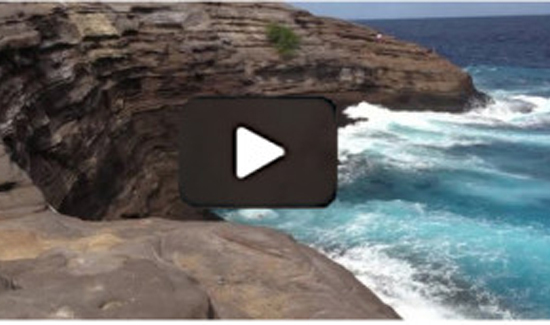 The video shows the woman jump into the water then almost immediately begin to struggle. Next, her friend jumps in and makes it to the shore. She does not and he attempts to instruct her, but the current pulls her about a hundred yards offshore. She is not able to get out of the water and cries for help. That’s when Arrubla grabbed two life jackets and sprang into action. He swam to the woman and kept her afloat until lifeguards on jet skis could get to them. The woman was not injured. Arrubla had a few cuts and bruises. Arrubla had been a lifeguard and a very good swimmer before he joined law enforcement, according to Phoenix police spokesman Officer James Holmes. On Sunday, Arrubla received an Award of Valor from the City and County of Honolulu Ocean Safety Division. – by Jennifer Thomas, azfamily.com, Posted on June 25, 2013 at 3:52 PM.